Quinnipiac defeats Brown in the last of a 3 game series. Quinnipiac’s Scott Zurevinski battles Brown’s Mike Clemente for the puck in the first period. Quinnipiac’s Kevin Bui skates toward Brown’s offensive zone in the first period. Brown’s Mike Clemente lets in the second goal in the first period. Quinnipiac players celebrate after Kevin Bui’s goal in the first period. Quinnipiac’s Connor Jones gets checked by Brown’s Kyle Quick in the first period. Quinnipiac players battling Brown for the puck in the first period. Quinnipiac’s Scott Zurevinski battles a Brown defender for the puck. Quinnipiac’s Yuri Bouharevich takes a shot against Brown in the second period. Quinnipiac’s Reese Rolheiser grabbing the puck in the offensive zone during the second period. Quinnipiac’s Kellen Jones fighting for the puck against Brown defenders in the second period. Quinnipiac’s Spencer Heichman settling the puck during the second period. Quinnipiac’s Clay Harvey scores a goal against Brown in the second period. Quinnipiac’s Kellen Jones passing the puck during the second period. Quinnipiac’s Matthew Peca falls to the ice in the second period. Quinnipiac’s Connor Jones battles for the puck during the second period. Quinnipiac players celebrate a goal in the third period. Quinnipiac’s Matthew Peca checks Brown’s Jack Maclellan in the first period. Quinnipiac’s Matthew Peca enters the offensive zone during the first period. Quinnipiac’s Kellen Jones plays offense against Brown in the first period. Quinnipiac’s Kellen Jones takes a shot in the first period. Quinnipiac’s Spencer Heichman enters the offensive zone in the first period. Quinnipiac’s Jeremy Langlois battles Brown’s Jeff Buvinow for the puck in the first period. Quinnipiac’s Connor Jones plays defense against Brown in the second period. 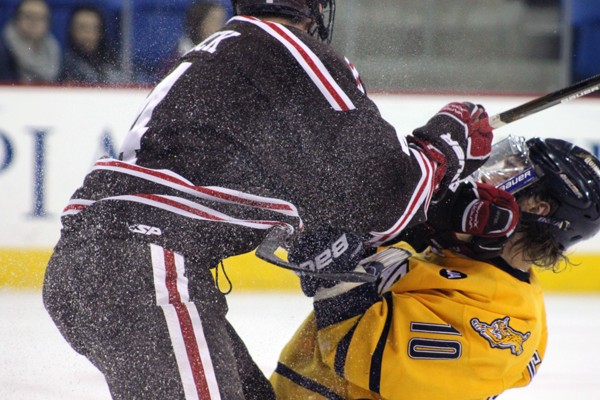 Quinnipiac’s Connor Jones gets into an altercation with Brown’s Garrett Hathaway in the second period. Quinnipiac’s Cory Hibbeler battles for the puck against Brown’s Dennis Robertson.